This spring has seen record-breaking warm temperatures across Alaska. In the Yukon-Kuskokwim Delta, the Kuskokwim River is melting early, with devastating consequences. 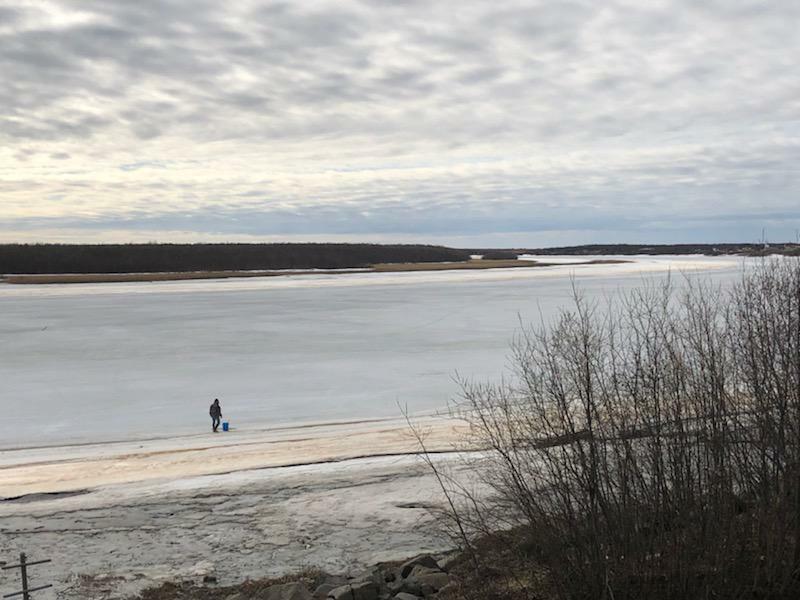 Bethel residents woke up to a warning earlier this month to stop driving on the frozen Kuskokwim River. “Last night, our worst fears were realized,” said Bethel Search and Rescue volunteer Mark Leary, talking on KYUK’s morning radio show. He, along with a handful of other volunteers, had just rescued three men who had been traveling on all-terrain vehicles and fell through the thin ice. The rescuers crept very slowly over the weak ice, surrounded by open water and tethered to a safety line. One of them fell through, but pulled himself out. In the end, they were not able to save two other men. “As the ice rots more and more, I don’t think we’ll be able to pull that off again,” Guest said. Historically, ice doesn’t get this weak in Bethel until May, but that has changed. This year, it started happening in March. “This is something we haven’t experienced before, so early and getting bad so fast,” Leary said. As the climate warms, Alaska is heating up twice as fast as the global average. Bethel experienced its warmest February and March on record this year. Now the melting ice is disrupting daily life, like subsistence hunting. John Fitka lives in Tuntutuliak. Usually he’s outside on the frozen river, hunting seal this time of year. “The trail conditions are just too dangerous to risk it. I did get two small seal, but I guess we just have to make do with what we have,” Fitka said. Bethel and the surrounding communities are off the road system. In the winter, people traveling to other nearby villages drive on the ice road. In the summer, they travel by boat. Both are much cheaper than the only other option, which is flying. Christopher Ondola was at the Bethel airport on his way back to Tuntutuliak. He usually drives the ice road this time of year, but this time he flew, even though it’s just 44 miles away. “I’ve been too scared to go anywhere on my snowmachine because of the ice,” Ondola said. The high price of a ticket limits the number of times he can come to Bethel to pick up groceries, fresh produce, and wood for his steam house. Last month, Ondola lost a friend who drove a snowmachine into open water. “It’s just too freaky-scary,” Ondola said. Last week, friends and family attended funeral services for Nelson Jackson and Ernest Demantle, who fell through the ice on four wheelers. Normally they would have driven on the ice road; this time they flew.